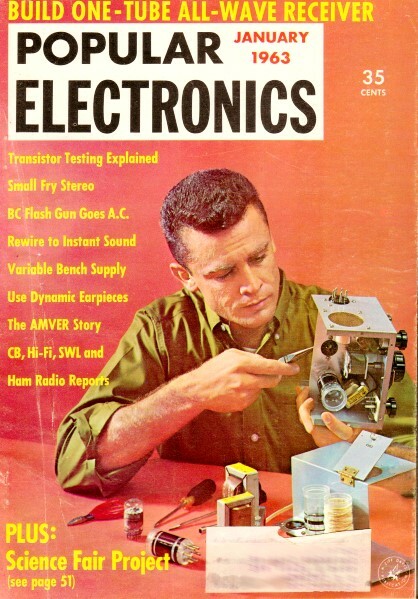 The early 1960s was evidently a good time for printing quizzes in electronics magazines. Popular Electronics was no exception. As I look through my collection I am finding quite a few. 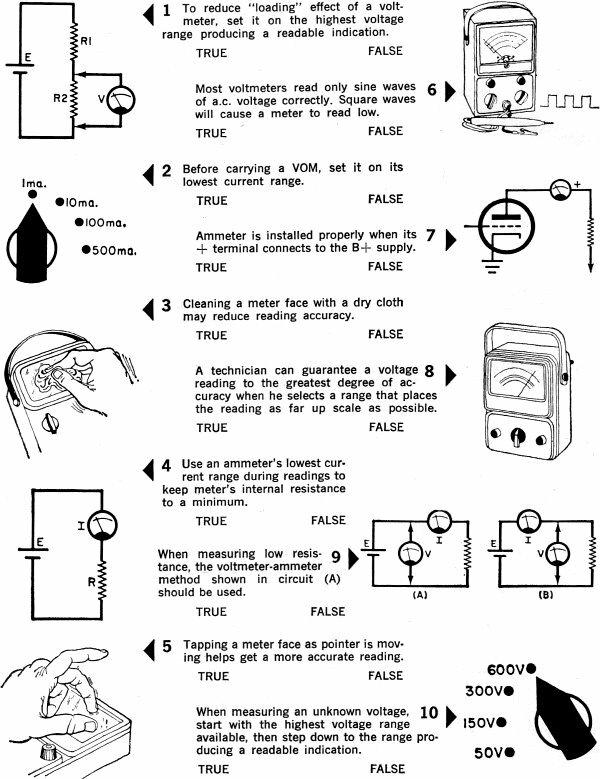 Here is the latest, from the January 1963 edition, that tests basic knowledge of using analog multimeters (digital types were not around yet). All are pretty straightforward; however, be careful with question 9. At first I thought maybe it was a trick question, but the key to arriving at the correct answer is noting that you are measuring a low resistance. 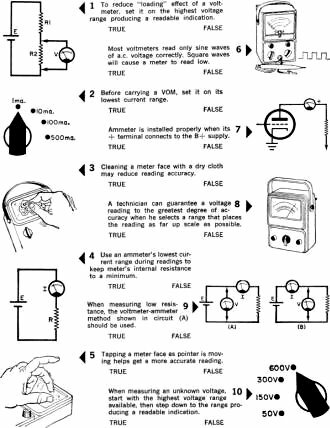 Be sure to consider the properties of a standard multimeter of the era. Give it a try for yourself to see how well you fare. There was another Electronic Measurement Quiz in the August 1967 Popular Electronics. 1 TRUE. If a voltmeter is rated at 20,000 ohms-per-volt, it has an input resistance of 100 times 20,000 ohms on its 100-volt scale, and 600 times 20,000 ohms on its 600-volt scale. The higher this shunting resistance is, the less it re­duces the resistance across which the voltage is measured. 2 FALSE. If the instrument does not have a transit (shorting) position, set it on its highest current range-because the meter will then be using its lowest value of shunt resistance. If the meter coil is jiggled while being moved, the volt­age it generates can produce the largest amount of damping current. 3 TRUE. Glass-and .especially plastic-meter faces will have a static charge built up on them when they are rubbed with a dry cloth. The static charges will attract the needle on the inside, and more dust on the outside. Use a cloth dampened with anti-static fluid (such as Weston's "Statnul"). 4 FALSE. Use the highest current range because the ammeter pointer is least apt to "pin" against a stop. Once the current magnitude has been determined, step down to lower current scales. 5 TRUE. Meter friction due to worn bearings or dirt tends to make the needle stop too soon when it is slowing down for an indication. 6 FALSE. Most meters are of the D'Arsonval type, which responds to the average value of the signal waveform. An a.c. meter scale increases this reading by a factor of 1.11 in order to indicate r.m.s. values of sine waves. For a square wave, r.m.s. and average are the same; hence, the factor is not needed and the meter will read high. 7 TRUE. An ammeter deflects correctly when electrons enter its negative terminal and leave by its positive terminal. 8 TRUE. If the accuracy of a meter is given, for example, as 3 % of full scale deflection, it means that a reading taken anywhere on that par­ticular range is accurate to only 3% of the total range on that scale. Therefore, if reading accuracy is what you want, select the smallest range that can indicate your reading. 9 FALSE. When determining low resistances, don't measure the voltage drop across both the unknown resistance and the ammeter. The ammeter resistance might be of the same magnitude or greater than the unknown resistance and introduce large errors. 10 TRUE. In selecting the highest voltage scale, you reduce the possibility of "pinning" the pointer against a stop. Once the voltage magnitude is determined, step down to lower voltage scales.